[New for 2017] I'll admit it, I had no intention of trying the new hazelnut variation this year. I figured I'd either let Nick review it or just skip it entirely, but I somehow accidentally put a thought in my brain and I couldn't get it out. You see, I've never reviewed a hazelnut product that has clicked with me... but what if this is the one? Could an abundance of chocolate win me over? I think we've all had a double magnum bar by now right? Ok, good, let's get to the flavors then and skip over the basics. Chocolate is definitely the most abundant flavor here, but it's the hazelnut that brings the most unique note. I put it that way because it stands out while not completely dominating. I guess this is a good thing considering how the cookies weren't much of a factor in this year's other new magnum bar. I mentioned hazelnut not being my thing and this bar isn't going to change that. After a few bites I realized this fact, but I pressed on anyway. 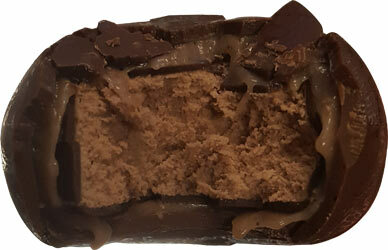 I do give the bar credit for just it's pinpoint, sweet, hazelnut flavoring that is surprisingly consistent in every bite. 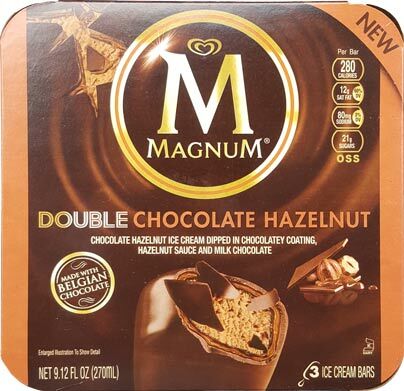 You still get the crunch of the double chocolate shell, and the chocolate ice cream does provide a bit of a chocolate finish to every bite, but that hazelnut will not be forgotten at any point. Is it always there. This is not hazelnut ice cream, this is distinctly a hazelnut sauce doing it's thing. On Second Scoop: I'll be honest, I don't really know what to make of this bar. It's decent and the hazelnut is not overbearing which is nice. I assume those who love hazelnut will say this reminds them of a candybar but I'm still just not that in to hazelnut. Give this is a try if you want, but I'll be sticking with more traditional varieties. I love this bar! I think it's the best Magnum bar in the US. I tried that one. I had low expectations because my last Magnum bar was very disappointed, but these completely hit the spot! I'm a fan. I tried this today but the hazelnut wasn't the best. I'm not sure if it was just my one but my hazelnut sauce was really icy. What I meant by that is that it wasn't silky smooth it had lots of ice crystals. Was this the case for yours as well? Did you let it temper at all? Yup, it's a thing! 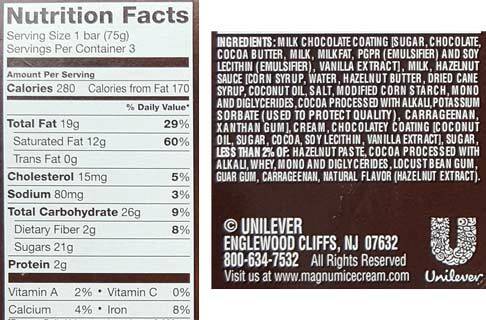 For ice cream in general it means a softer product, but in the case of double shell magnums, it means getting that middle sauce layer to act like a sauce.